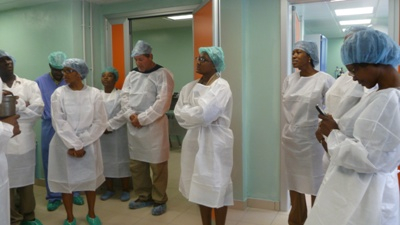 The new operating room was inaugurated last Monday, November 19th. Equipped with up-to-date technology and furniture, the room was funded by the Francesca Rava Foundation through NPH Italia. 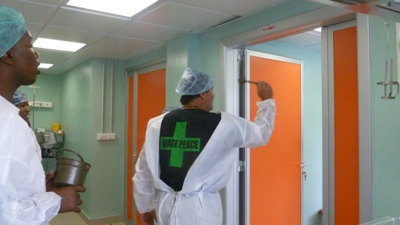 The first operation to take place in the room was performed by Dr. Jean Edgard Aupont, the Head of the Maternity Ward, Dr Jean Junior Jazon, an attending OBGYN, Anesthesiologists, Drs. Magdala Pavrette and Joanne Duchatelier Domercant. Assisting the doctors was Head Operating Room nurse, Mme. Edna Benjamin, and INFs Claudine Beltinoire, Merline Obey, and Louisena Francois. The typical team would comprise four members: one OBGYN, one Anesthesiologist, one operating room nurse to assist the surgeons and one auxiliary nurse. However, for this first case on the very first day of opening, it was necessary to have a back up team to make sure that everything was perfect. To start the ceremony, our beloved Fr. Richard “Rick” Frechette led the attendees in prayer, after which Dr. Jacqueline Gautier, the Executive Director of St. Damien Hospital, spoke directly to the hearts of everyone present while reminding us of the NPH mission – to care for the marginalized children of Haitian society. 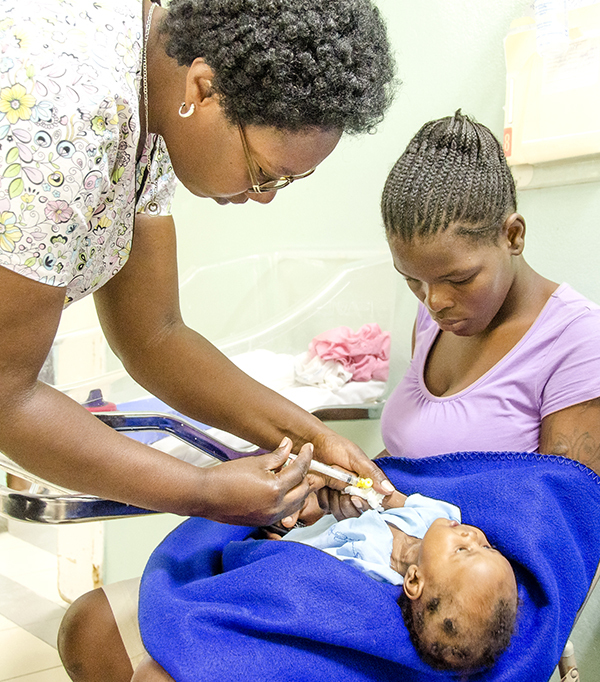 Following Dr. Gautier’s eloquent words, Dr. Aupont, the Head of Maternity, complimented and congratulated the entire Maternity Ward team of new and current employees for the strong collaboration and consistent “esprit de corps” that continues to reinforce St. Damien Hospital’s reputation as a pillar in medical care in Haiti. Immediately following the prayer and speeches, Fr., Rick blessed each room of the OR asking God for His divine inspiration and guidance in all procedures that take place there. Because St. Damien Hospital is known for its reputation of providing quality medical care for extremely high risk pregnancies, 38 year old Mrs. Rosemarie Louis was referred to this hospital during her second pregnancy. 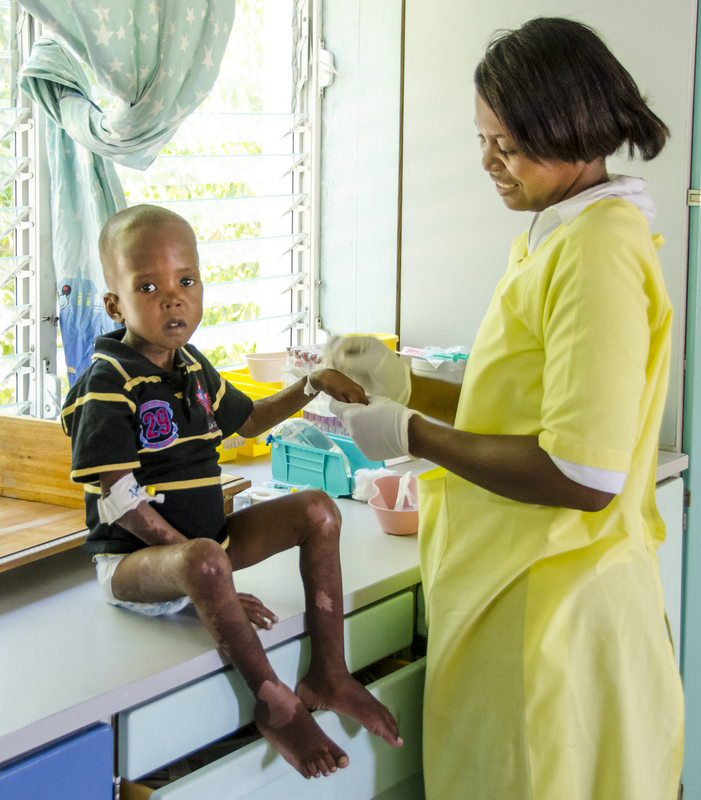 The medical care was provided free of charge to Rosemarie because she cannot afford it. As a second time mom who is unable to deliver a baby through natural childbirth, she underwent a Caesarean Section to give birth to a very healthy 7 lbs. baby girl. The baby, known immediately after birth as Baby Louis, was extracted speedily and without incident. Dr. Aupont explained the necessity of performing a Caesarean Section on Rosemarie to prevent potential complications due to previous surgery for fibroids. 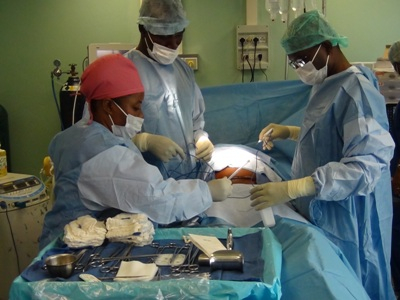 Considering the doctors first had to remove a mass of keloid from Mrs. Louis’ two previous surgeries prior to performing the procedure, the operation was a success. 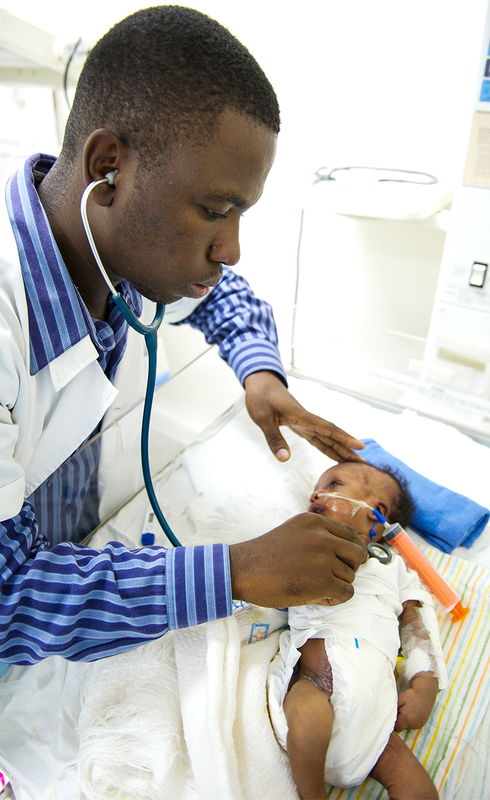 The team is grateful for the modern equipment that has been donated to the hospital. As you can see in the pictures, Dr. Aupont is using the electric scalpel to remove the keloid from Rosemarie’s abdomen. Additionally, the electric scalpel was used to remove multiple layers of scarred tissue before extracting the baby. 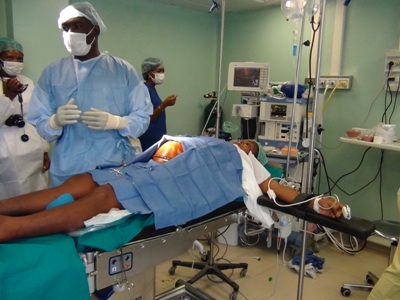 Also in the pictures, the Anesthesiologists are using the new machinery to monitor Mrs. Louis during surgery. The impact of our supporter’s and friend’s contributions will multiply many times over as St. Damien continues to carry out its mission on behalf of Haiti’s poor. 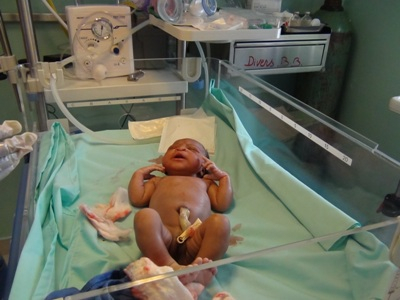 Another baby is welcomed into St. Damien Hospital thanks to the hard work of the team!